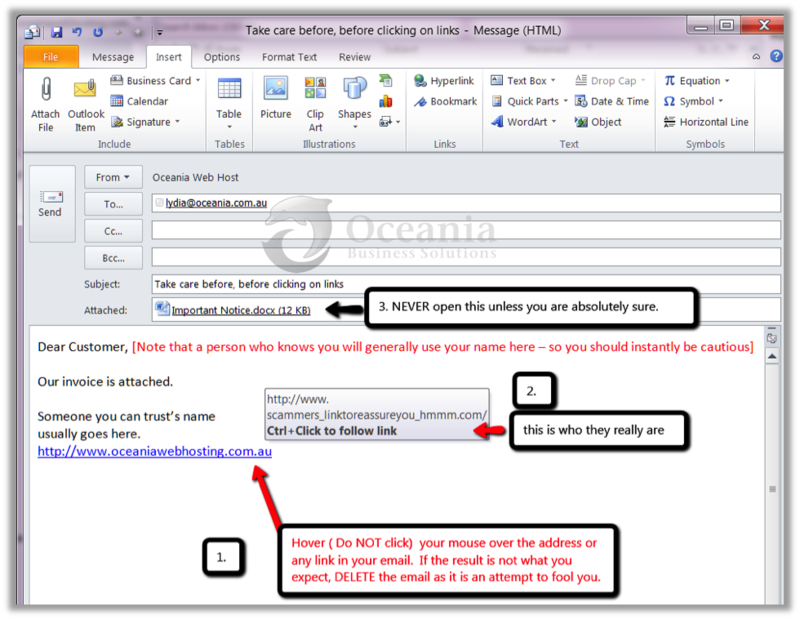 These days there are so many emails masquerading as organisations or people you know that it is easy to be scammed UNLESS you employ a couple of simple tricks. Never open any emails unless you are 100% sure you know the sender. How can you tell whether the sender is really who you think it is? Beware if they do not use your name in the greeting. Look for incorrect spelling or grammar. Desktops: Hover your mouse over the links to determine where they will take you. Devices – like ipads, phone etc. Hold your finger on the link for a couple of seconds until you reach the “Open” window which shows the real address of the link. This announcement is brought to you today as there are a spate of emails circulating that are very cleverly disguised to look as though they have come from trusted providers like Microsoft. The links in such documents contains malware that will compromise your mail flow capabilities and render your account useless.